While home I found a fantastic new artist, Melbourne born Mandy Renard, b. 1976. Mandy moved to Hobart in 1999 to study at the Fine Arts at the University of Tasmania, which is where I went! It's a fabulous Uni. 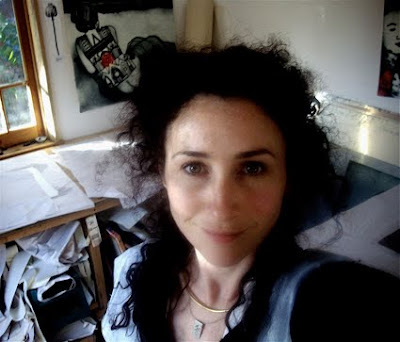 Mandy continues to work from her studio at Neika, Tasmania. Her work has a subtle familiararity for me. It might be the beautiful dry-point etching figures and earthy tones remind me my former lecturer, Barbie Kjar, or maybe it's her reference to the Tasmanian landscape, so wild and rugged, that she portrays. I really love Mandy's freshness and her depth of detail in each piece. With themes of beauty, love and a sense of 'home' there's something inately endering, alluring, strongly feminine, romantic, mythical and elegant in her work. I've chosen a few pieces to share with you. 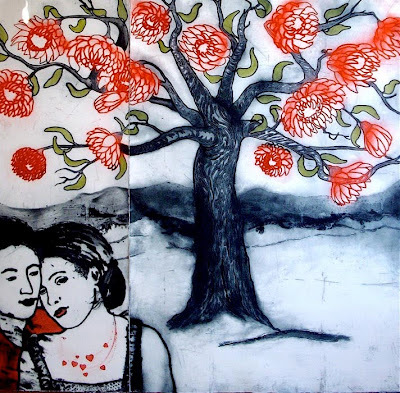 Mandy's work can be found locally at the Handmark Gallery, Hobart, or online here. Bless: Hand-coloured drypoint etching, 107 X 111cm, 2008. Edition of 20, sold out. 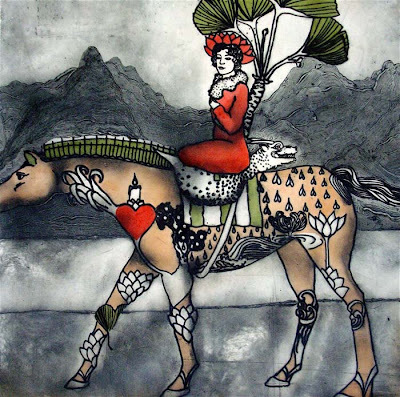 Ex Amata: Handcoloured drypoint etching, 72 x 73cm unframed, 94 x 96cm framed, 2009, AUD $1005 / €640. 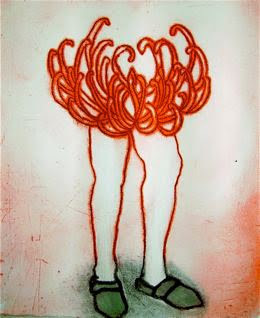 Big Fleur: Hand-coloured drypoint etching, 107 x 74cm, 2008. AUD $1210 / € 765 framed. $925 unframed. Edition of 20. 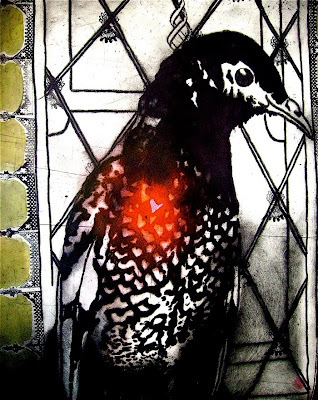 Love bird: Hand-coloured drypoint etching, 119 X 72cm, 2007. AUD $1000 / €638. 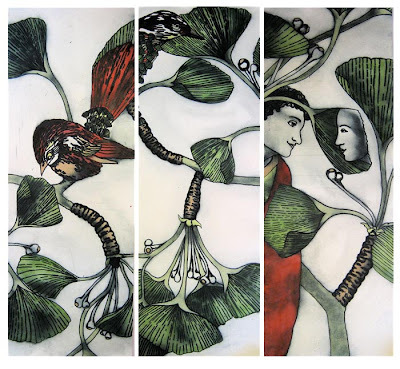 When the Stars Say 'Now' the Ginko Drops its Leaves: drypoint etching, edition of 20, 120 x 116cm in total triptych, 2009. Edition of 20, sold out. Would you mind contacting me in relation to your artworks.